When Derek Jeter became the all-time Yankees hit leader, I was thrilled. I couldn't have been happier being the big Jeter lover that I am. However, I understood why non-Yankee fans wouldn't care about the accomplishment. I couldn't care less if someone broke a Chicago Cubs record or a Detroit Tigers record. So why should anyone other than Yankee fans care about Jeter breaking the franchise record. Apparently, Upper Deck thinks everyone should care and created a card to commemorate the feat. This card was inserted into random packs of 2009 Upper Deck Series 2 and is numbered to /500. 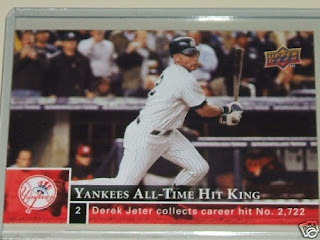 The official name of the card is 2009 Upper Deck All-Time Hit King #SP3. As of Tuesday night, six cards show in the completed listings as being sold for an average $30.71. The price went as high as $40, but have seemingly dropped to under $25 more recently. Like the other day with the goofy Jeter gimmick in the Heritage High Series, I'm just not a fan. Funny, I didn't really care about the record (I'm still shocked that no one has had 3,000 hits as a Yankee), but I think that's a nice looking card. IF Upper Deck decided to commemorate records like this for all teams, then I'd be give it the thumbs up, but my sense is that it will probably be exclusive territory of the Yankees or Red Sox. That said, by not numbering it as part of the base set and not being a pointless gimmick (this actually commemorates something) I have no problem with this at all. Heck, they could have even made it part of the base set and not SP'd it and I'd be ok with it. History is history after all, even if it is a history I don't particularly care about. I'm actually sick of Derek Jeter, but I don't have a problem with this card. Unlike the nonsense that Topps put out, this actually commemorates an event and is numbered as an insert so it won't mess with anybody putting together a base set. I think it's easier to not be a Yankee hater when you're a National League fan, such as myself. That being said, the Yankees are the most storied team in baseball history so setting a record with them is understandably bigger national news than it would be for other teams. I don't mind this one at all. It's sorta meaningful and looks good. Nothing wrong with that, and as mentioned, it seems to be more of an insert anyway, stealthy though it may be. That said, I loooooooove the Jeter and Pedroia Heritage SPs. They are hilariously awesome in and of themselves, but the fact they appear to be exist for no other reason than to piss off Yanks and Sawx fans puts them on a whole other level. Epic troll, topps, epic troll. Maybe even a Crowning Moment of Awesome, and certainly a Crowning Moment of Funny. I pulled one of these, but it's not numbered and I didn't get it from Series 2. I think it came from a box of SP.